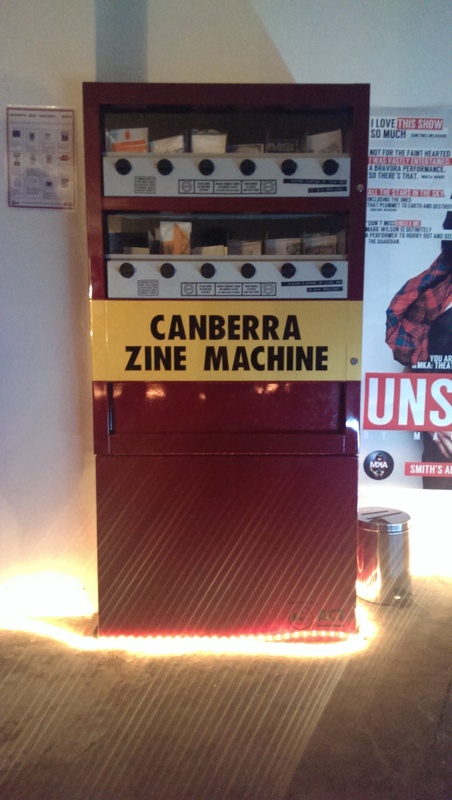 So Thursday night I attended the Zine Vending Machine Launch at the start of You Are Here. The director of ArtsACT, David Whitney, made an intro and vended a couple of zines (one of which, I’m glad to say, was mine). The machine itself is a wholly mechanical affair, requiring no electricity to run, simply put in a two dollar coin and turn the handle to get a zine. The vending machine will stay in the Money Bin where it will be relocated to Gorman House for the Zine/DIY Fair. and, Unbroken Poetry, which is by me. This entry was posted in zine and tagged canberra zine emporium, zine. Bookmark the permalink.